At GE Healthcare, we see a few key forces and trends that are coming together to re-shape how we think about Imaging and what the future holds. We call it Beyond Imaging. Introducing an all-new digital imaging experience from GE Healthcare. Attend our various workshops ranging from the Future of X-ray, Digital Mammography, Liver Care, and much much more, while earning CE credits. Network with peers and stay after the workshop to learn how Intelligent devices, Analytics, and Artificial Intelligence may impact medical imaging in the future. Workshops held every morning. Take a tour through our Beyond Imaging exhibition with demonstrations by our GE experts and partners Microsoft and Intel. Learn more about technologies and services available to support your digital imaging programs. Optima XR240amx mobile X-ray, Imaging Insights, Mammo Insights Technology for Mammography, Quality Application for X-ray, ASSIST for Interventional Image Guided Systems, LOGIQ E10 Ultrasound, MR and Discovery. Dynamic and engaging thought leadership and networking events where you will explore the incredible advancements happening in digital imaging technologies: Artificial Intelligence, computer power, and fast / secure networks that can help enable healthcare organizations to revolutionize healthcare. Coming to a city near you ! We know that everyone has a busy schedule and cannot always attend key conferences and tradeshows or join the webinars you want to. That’s why we are bringing healthcare digital experts to you with the Beyond Imaging City Tour! Made possible through collaboration with industry leaders who make the future possible today. eHealth solutions from Microsoft enable your digital transformation while making individuals and communities around the world healthier. Smart, scalable performance for the widest variety of AI and data center workloads. Imaging Protocol Manager is a cloud-based, multimodality, protocol–management solution that provides access, insight, and governance for imaging device protocols, helping providers effortlessly deliver the right exam for each patient, every time. You can’t be everywhere at once, but now your protocols can. 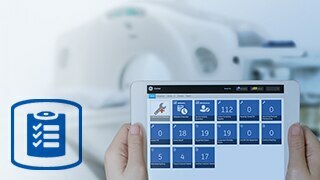 Built on GE Healthcare’s Applied Intelligence platform, Imaging Insights provides comprehensive, actionable insights across modalities (MR, CT, X-ray, US, etc.) and multiple vendors by merging data from the machines and the Radiology Information System (RIS). iCenter provides insights for hospital managers to improve operational performance, asset utilization, and asset performance.